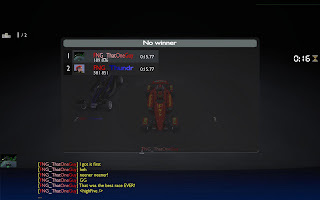 Both ThatOneGuy and Thundr cross the finish line at the buzzer, Thundr a millisecond or two behind ThatOneGuy... both with the exact same time for the lap. Epic finish to an epic race. 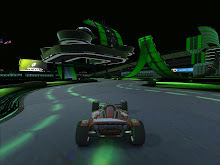 Tonight was a TrackMania night for ThatOneGuy, Thundr and Atholon. You might call it an "Island Vacation", as the night was dominated with Island tracks. And there was much rejoicing. Atholon knocked off before the TrapMania tracks started cycling on the server. One of them was a very short track with a sharp 90-degree turn at the beginning, coming straight off turbo pads, followed by an unnatural chicane right after, then another quick/wide 90. Get past that and you're met with a short jump to a piece of road with a column right-in-the-middle, then a high loop to the finish line. It was taking us 20-30 seconds to finish a run at first... but by the time the Time Attack timer was about to finish, Thundr and I were racing to finish our last laps; both trying our best to beat that last sliver of a second. Literally at the buzzer, I fly through the gate only to see Thundr flying through milliseconds after. I bring up the scores and we both have the exact same time. Immediately after, the podium screen appeared. Because I got the time first, I kept the first place. 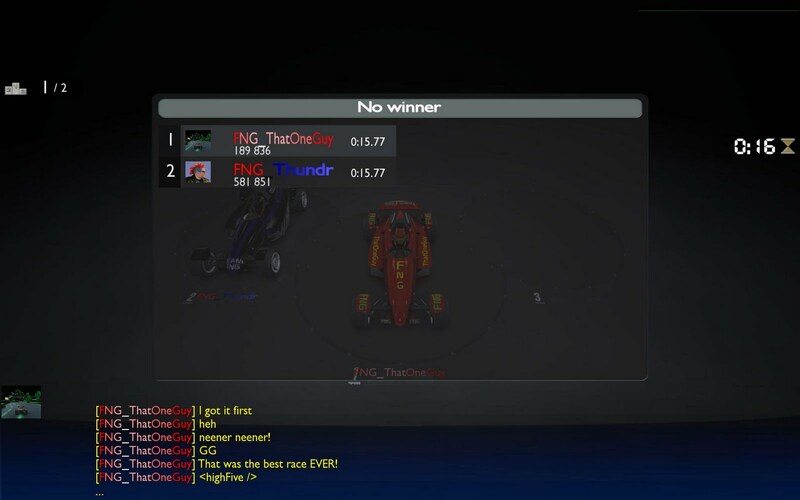 It was, hands-down, one of the most epic races in FNG history.